In full disclosure, these books are not all on my Kindle. In fact, I don’t even own a Kidle device. I use the Kindle app on my iPad. Some of these books are in that app. Some in Apple’s iBooks app and even a couple in the Nook app. I also have a lot of them (all the older ones) in dead-tree form, sitting on my bookshelves. 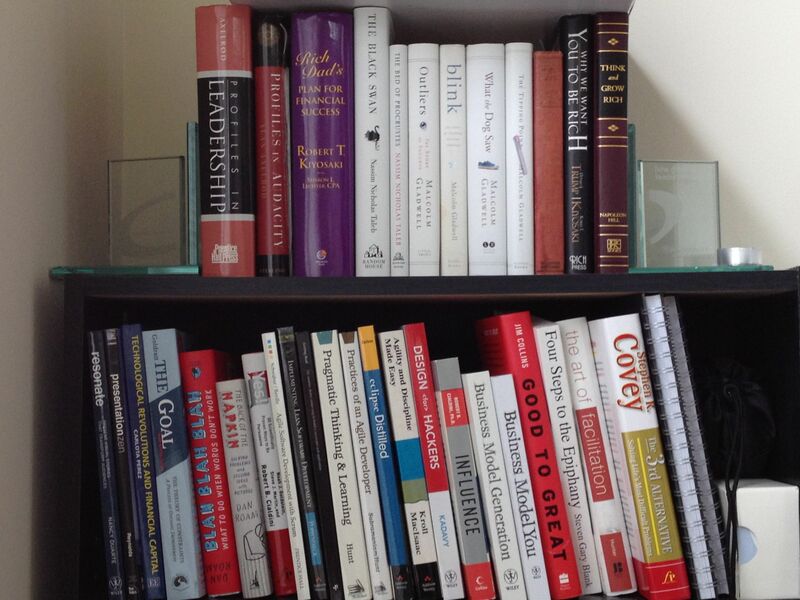 Picture of one of the bookshelves in my home office is attached. Yes, I love to read. So, here goes. Here is what I have read, am reading or own the book and plan to read soon. Rules for Revolutionaries – Guy Kawasaki. Guy shares great insights in this book from his personal experiences – he was the second Software evangelist at Apple and the most (only) famous one. Enchantment – Guy Kawasaki. I have not yet read Enchantment, but watched Guy’s pitch for the book on Stanford’s eCorner and it is on my iPad, waiting to be read. Founders at Work – Jessica Livingston: All great artists and architects spends a good part of their education studying the works of other greats. Jessica’s book is like an archeological dig on some great companies, from Microsoft to 37signals. A must read. Good to Great – Jim Collins: This is an all time classic. I read it years ago, when it first came out. Plan to read it again soon, or at least page thru it to refresh my mind. The Tipping Point – Malcolm Gladwell: This and the next two books by Malcolm Gladwell are modern classics that I have read all of . In Tipping Point Malcolm explains why some ideas ‘tip’ or in tech lingo – go viral, and others do not. Who the Mavens are – people like Scoble who can make an app like Instagram go gangbusters with a tweet. In Blink Malcolm explains the roots of intuition and expertise. How does one and should one follow one’s gut, provided one has trained ones gut to make the right call? In Outliers he explains who outliers are. Why one needs around 10,000 hours of grinding it out to become an expert. Why Gates and Jobs are the same age…? The Goal – Dr. Eliyahu Goldratt: This is a book that I have wanted to read for a long time. It goes over how Dr. Goldratt developed a system of continuous improvement, while working in an environment with constrained resources. Think life! I will post a detailed review after I have read it. Technological Revolution and Financial Capital – Carlota Perez: A classic on understating the sources and impact of funding. Win – Frank Luntz: Frank Luntz has been an advisor to presidents and Fortune 500 companies, doing both political and corporate branding. I have heard him speak. He knows how using (or not using) the right words can impact the message behind what one is saying. Must read for anyone who is constantly pitching. Rework – Jason Freid of 37signals: This was a breath of fresh air. It gave me a respite from the typical thinking that most companies have – it’s all about working crazy hours and going big. 37signals has become a large, successful and respected company without any of these. For those who may not know 37signals, they are best known as the people who created Ruby. Pragmatic Thinking and Learning – Andy Hunt: A great book on the power of intuition and learning, from a geeks perspective. Unleashing an Ideavirus – Seth Godin (free eBook): Need to know how to make something go viral, download and read. The Innovators Dilemma – Clayton Christensen: A classic. A must read for all innovators. This is where the term ‘disrupt’ came from. The Long Tail – Chris Anderson: It is what causes content created years ago to generate traffic many years from today. The Search – John Battelle: John explains why the battle is about searching for content (or your content being found). 7 Habits of Highly Effective People – Stephen Covey: A Masterpiece. This book needs to be a course in high school. 21 Irrefutable Laws of Leadership – John C. Maxwell: Another classic. It is probably the best book on leadership ever written. John Maxwell has spoken at the White House, Congress and the UN, to name a few and countless business conferences. He is the best at teaching leadership. Influence – Robert Cialdini: This and the next book are great books on how marketing and influence work. Business Model Generation – Alexander Osterwalder: If you want to learn how to develop a business model that can sustain, scale and generate revenue, this is the ultimate source. The Lean Startup – Eric Reis: A modern classic. This book changed the whole startup world, from Silicon Valley to Bangalore. I will go into much more detail on this book in a future post. The Four Steps to the Epiphany – Steve Blank: Steve Blank teaches Entrepreneurship at Stanford. I have watched several videos by him. Ordered this book just last week. Running Lean – Ash Maurya: Ash has taken Alexander Osterwlader’s Business model canvas and modified it for Lean Startups, specifically web/mobile startups. Steve Jobs – Walter Issacson: If there is a place for an techie to start, this book is it. I will post more on it later. One lesson I have learnt already – don’t emulate the early Jobs. Emulate the Jobs who had learnt from his mistakes and learnt how to address his weaknes ses. The Jobs after his win with Pixar and his return to Apple. I will update this post regularly. Probably make it a dedicated page on my blog, instead of a post. Keep coming back to check. Also, do leave a comment suggesting books you love and think I should read. Previous Post What do tools and automation buy me? Next Post I am looking forward to IBM Innovate and so should you.